The Mowgli’s Katie Jayne Earl. Photo, the Bowery. We are halfway through December to Remember, the winter concert series produced by 94.7 KNRK.At a time when sunny, weekend-long music festivals are a thing of distant memory, December to Remember gives music lovers the chance to enjoy really good music, real time. This week has seen the likes of Grouplove, The Neighbourhood, Alt-J, Vampire Weekend, Tame Impala, Foals, MS MR, The Mowgli’s, and reigning alt-pop queen Lorde. Up next we have Young the Giant, Fitz and The Tantrums, Bastille, The Features, NONONO, Phoenix and Portugal. The Man. In typical December to Remember style, tickets sold out quick–some even hours after they were released in October–with Portland fans clamoring for an early winter hit of radio-ready indie rock. 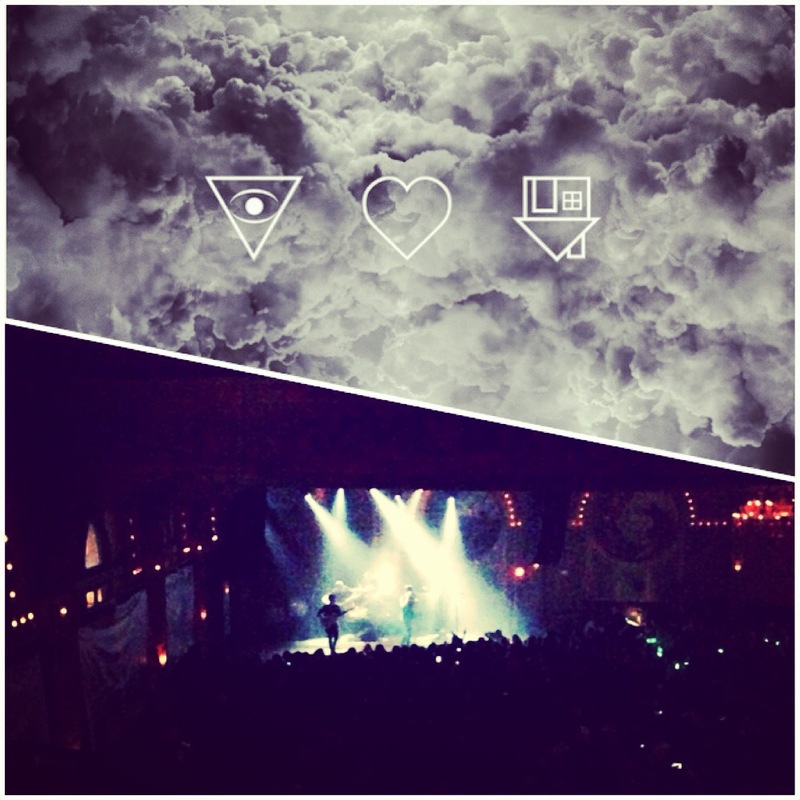 The series kicked off Sunday with The Neighbourhood playing at Crystal Ballroom. My concert-mate and I missed the opening band and there wasn’t an encore (perhaps due to the relative newness of the band) so the show felt quite short. But the content was there, and they were engaging performers. Their quick-but-dreamy style is a common thread in the songs on their simply named micro and full-length albums “Thank You,” “I’m Sorry” and “I Love You.” and is best exemplified by their hit “Sweater Weather,” which evokes a life lived through the Early Bird Instagram filter. The Neighbourhood playing at the Crystal Ballroom and their “I Love You.” album cover. The Mowgli’s played to a packed Crystal Ballroom on Tuesday. Their hit “San Francisco” is a poppy exercise in peace and love with a catchy pace and just enough tambourine. Unselfconscious lyrics take center stage across the board, including “Love is Easy” where the band cries out about love: “You can try it in the morning, try it out in the rain.” The eight person collective consistently boasts an upbeat chorus anthem sound. Grouplove and MS MR rocked a sold-out Crystal on Thursday. Grouplove forges a sound somewhere between the shrillness of Modest Mouse and the noisy studio sound of Gauntlet Hair, and pull it off with indie-pop precision. Keeping with the theme of big vocal sounds coming from many members of the band, Grouplove vocals sound unafraid and at times pleasantly off. Taking a darker, more soulful turn, MS MR’s chilly ballads like “Hurricane” (“I jumped the gun/ So sure you’d split and run/ Ready for the worst/ Before the damage was done”) and “Think of You” (“You got high off my devotion/ I was addicted to your touch”) take us deep within an icy abyss of heartbreak and the fragile beauty of the heart. Also look forward to Bastille, the current kings of chorus-anthem rock. Their grand sound is supported by a strong lyrical backbone–each song telling a moving story. Both “Pompeii” and “Things We Lost in the Fire” are booming songs worthy of a musical or a sold-out coliseum. So is December to Remember more than just a cluster of concerts taking place around the same time of year? Meredith Bedrick, an ardent fan of December to Remember, thinks so. “Spring and summer are such good times to see music, and then you go through fall and really start missing that,” Meredith says. She wanted to buy tickets to every show, but decided on four: The Mowglis and Foals, as well as the upcoming Fitz and the Tantrums and Bastille. Meredith stayed away from the big names like Phoenix, thinking they’ll be back to Portland while some of the smaller bands might not be for some time. She caught the Mowgli’s at a free Mississippi Studios show and was hooked. “They only played a few songs, so I was really wanting to see them when they came back. I saw them in such a small, intimate setting, it was different to see them at the Crystal Ballroom with a big crowd,” Meredith says. Barring already purchased tickets or the magic of Craigslist, those looking to get a slice of the remaining shows can visit the 94.7 homepage for a live stream of the shows, and check out the 360 degree views of the shows, shot by Google-trusted photographers from 360labs. It’s not quite like being there, but hey, procrastinating winter-concert goers can’t be choosey. Plus we’re still seven months away from Sasquatch, so get your indie-rock fix while you can.